Constructed of sturdy paperboard, Therapak disposable racks are shipped flat and assembled in seconds to reduce freight costs and decrease storage space. Tubes remain securely in place during processing and transport for protection and identification. All three Racks are printed with a numerical sequence for easy reference. The TearTech® 25 hole foam rack is a versatile tube transport system that provides cushioning and protection for blood tubes, urinalysis tubes and many other commonly transported test tubes. The die-cut construction allows users to tear away any number of tube holes for transporting from 1 to 25 tubes. This allows the user to customize the transport payload day to day for all tube transport needs when sending specimens within a courier network or via common carriers for subsequent laboratory testing. 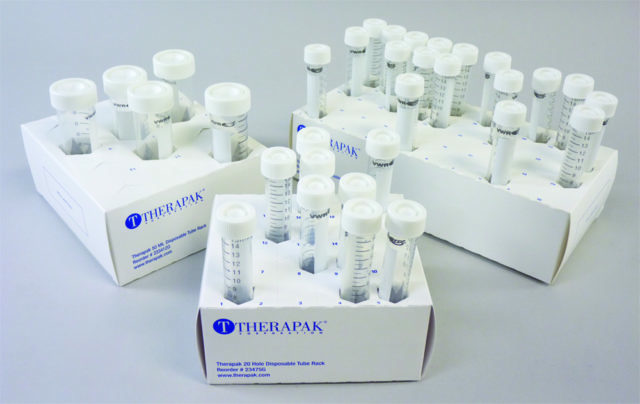 Combine with Therapak ambient kit boxes, insulated shippers (refrigerated and frozen), specimen bags and absorbent material to complete the specimen shipping requirements. TearTech® 25 hole foam racks are available in case quantities as an individual item or with a 13 x 18″ specimen bag with absorbent for direct placement into common insulated shippers (see 56519 Small Insulated Shipper). 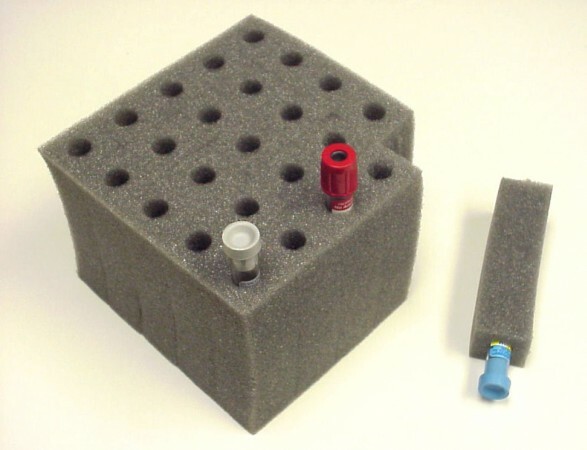 Overall foam block size is 150 mm x 150 mm x 100 mm. Racks can be used as ten half-shells or five complete, leak resistant, storage and transport racks. The Test n’ Toss™ rack holds up to eighty test tubes ranging in diameters of 13–16 mm and heights of 75–100 mm. 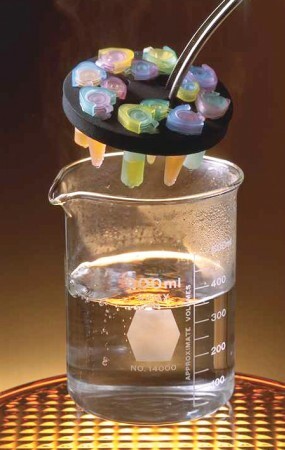 The test tubes are stored in a leak-resistant plastic shell that contains spills. The rack’s use permits it to hold, transport, store, refrigerate, and incubate test tubes. It can be disposed after contamination occurs. 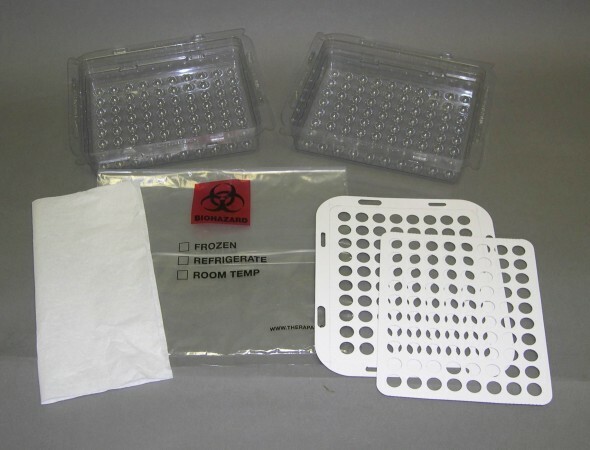 Shipments contain ten half-shells with dividers to stabilize test tubes. The half-shells can be interlocked to make five covered, stackable racks. When interlocked, both dividers from each half-shell can be placed within the joined unit. This function allows the test tubes to remain secure and upright during transportation or storage. For transportation of these racks please refer to the absorbent and bag sections of our online catalog. Round, versatile, 16-place BeakerBath™ Floaters are ideal for high-temperature incubation of micro-sample volumes in standard beakers or water baths. Microwavable polyfoam Floaters ensure microtubes are immersed at same depth, regardless of water level. Inner ring holds 4 each 0.5 mL to 0.75 mL microcentrifuge tubes, while outer ring holds 12 each 1.5 mL to 2.0 mL microcentrifuge tubes or BioStor™ Vials. Fits in 600 mL glass beaker.